After we arrived from Colombia, my parents – like many immigrants – quickly realized it was going to take a lot more than just a hard work ethic to be successful here. Both of my parents attended college in Colombia and later worked at banks there. They viewed America as an opportunity to chase what everyone calls the “American Dream” – and build on their careers. I always overhear my parents saying to each other: “I would have never thought I would be doing this to support my family.” Although their current positions working for hotel banquets and functions put food on the table, as I’ve gotten older I have understood how hard this is for them — to go from being successful and stable in Colombia to struggling to prove themselves in the United States. I saw the light drain from their eyes as they desperately tried to commit to work for which they felt over-qualified, and I also saw how it strained their relationship. All in pursuit of opportunity and future for their family. As a young girl back in Colombia, I remember being very optimistic about my family’s upcoming move to the United States. At four years old, I was teaching myself some phrases and common words I might need to know for my new life in the United States. When we arrived in America, I realized right away that while the language barrier might not be a problem for me, it was going to be difficult for my parents. At my first day of preschool, I felt defeated and like I would never learn the language or keep up with my classmates. This feeling of inferiority dissipated quickly though, and I found myself absorbing almost every word. Before I knew it, I was almost as fluent in English as I was in Spanish. I looked forward to going to elementary school every day. It was a place where I could continue to work on my English skills and where I could spend time with my friends. I didn’t have any friends in my apartment complex, so I was always excited to be around friends at school. But being in an immigrant family was often lonely. My parents used to work on holidays, and so my brother and I spent most holidays together since we had them off from school. I didn’t fault my parents for working holidays — they sacrificed a lot to support me and both of their work ethics have set such a positive example for me throughout my life. Still, my brother and I missed them, realizing then, that our family was not like the “normal” American family. Because we weren’t.I wished our lives could have included more quality time together and have been a little less hectic. As I got older, the strain on my parents’ relationship, the realities of being undocumented, and possibly not being able to further my education after high school become more clear to me. I would channel all my energy onto the soccer field; it was my outlet for all negative feelings. Unfortunately, this meant I kept things bottled up and didn’t talk to anyone about my feelings and concerns. I felt and was discouraged by everything. I had a sense of uncertainty and homesick for a place I was not even sure existed. I felt like I did not have a place anywhere. Eventually, though, it became too much to hold in and I opened up to my parents. They explained to me that being undocumented should not be something that should hold me back –instead, they said, it should be my motivation to push myself to be the best I can be, or better. The word “undocumented” has a negative connotation which even today remains a source of self-doubt and anxiety for me. 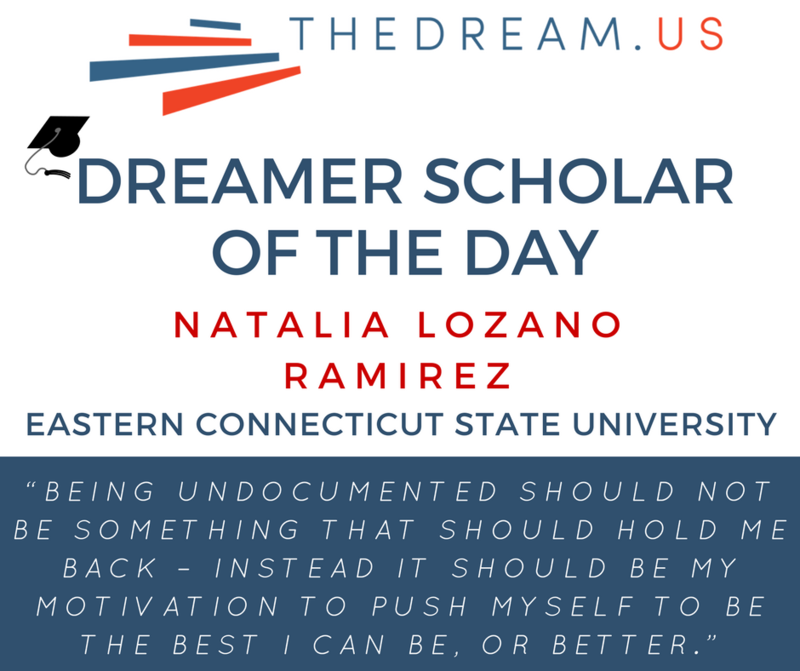 Yet being undocumented has also led me to amazing opportunities such as the Opportunity Scholarship through TheDream.US. This kind of support has not only been a huge confidence builder and means for me to access knowledge, but it also provides me a shot at molding myself into someone who is able to motivate others who, like me, struggle with these feelings related to being an undocumented immigrant. As a student at the Eastern Connecticut State University, majoring in Sociology and Criminology, I can work towards these goals and, like my parents tell me, be the best I can be (or better!). I am undocumented and I am unafraid.